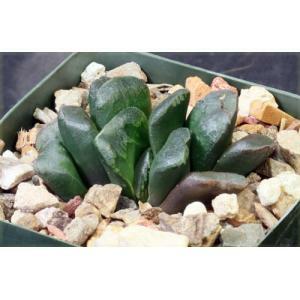 Haworthia truncata, from the Western Cape Province of South Africa, is a perennial favorite of plant collectors. 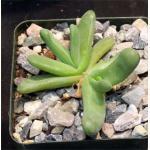 The horse-teeth like arrangement of leaves, which tend to form close to the soil surface, are usually a solid dark color. Cultivar ‘Sizunami‘ has more rounded teeth that tend to offset instead of aligning, as occurs in the typical species. These plants are rooted offsets in 4-inch pots.